As promised, blog posts resume today! We had a fantastic little trip. I'm so excited to share all the details with you over the next several days. 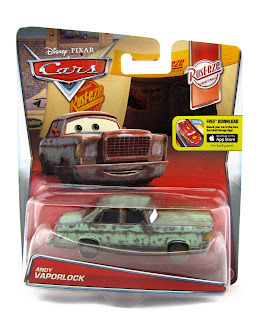 To start things off, I wanted to show off a brand new car I was able to find while we were gone... here we have the Mattel Disney·Pixar Cars 1:55 scale release of Andy Vaporlock! 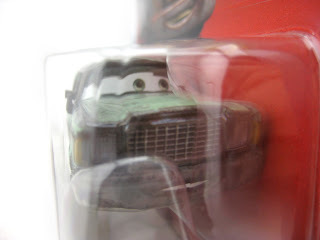 This character has just hit shelves and is part of the 2016 "Rusteze Racing" sub-series (#5/12). As shown in the screen shot above, Andy is one of the Rusteze cars seen in the sponsor tent after the film's opening race. 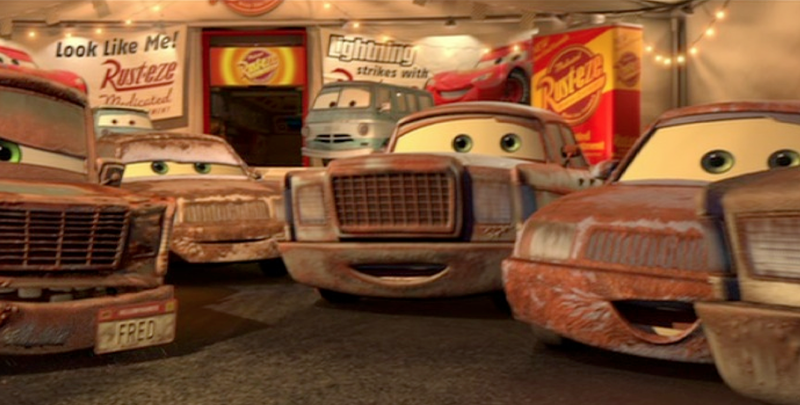 He is a rusty, dark green Sedan. I was able to find Andy at Target (in fact, it was the lucky Target I always visit when I go to my in-laws; I always find something there!) just a couple days ago. If you're interested in picking this one up, head to your local stores today to check for availability or purchase it on Amazon using the direct link below.